The battlefield can be one of the most useful places for robots. 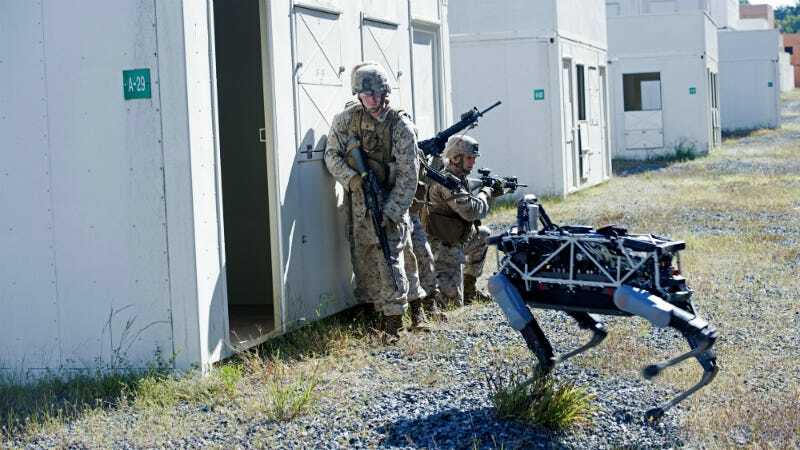 And now, the US Marines are testing out Spot, a robo dog built by Boston Dynamics to see how helpful the ‘bot could be in combat. Remember Big Dog, also from Google-owned robotics company Boston Dynamics? Well, Spot is a tinier, more agile iteration: At 160 pounds, it’s hydraulically actuated with a sensor on its noggin that aids in navigation. It’s controlled by a laptop-connected game controller, which a hidden operator can use up to 1,600 feet away. The four-legged all-terrain robo pup was revealed in February. Robots in combat aren’t new, but Spot signals a quieter, leaner alternative that hints at the strides made in this arena. Last week, the mechanized canine was put through the wringer in a battery of simulated combat scenes, from forests to urban fighting situations. Ars Technica reports that in one scenario, Spot was sent into a building ahead of the humans to scope out any danger, a task that the military might’ve used actual dogs for previously. The tests were conducted by the Defense Advanced Research Projects Agency (DARPA) alongside Marines from the Marine Corps Warfighting Lab. Spot highlights the United States’ forte in militaristic robots, but the reveal comes at a time where Asian and European companies are more actively pursuing friendly personal robots designed to live side-by-side humans, like Pepper in Japan. In addition to industrial exoskeletons and combat drones, Spot illustrates how different American robotics might be from other countries on the robotic forefront, like France and Japan. But for infantry, ‘bots like Spot can make a life-saving difference. Not only can they clear rooms and scout for threats, but they can help keep troops safe. Spot himself isn’t destined for the real-life battlefield, but he’s helping the Warfighting Lab come up with new ways of using robots in combat. According to a press statement on its website, the Marines “have been very receptive to the new technology,” so we’ll see what kind of combat-ready machines they try out next.